after this year's Pride Parade. As promised by his director of outreach on Monday, Alderman Tom Tunney’s latest weekly newsletter includes some statistics about the 2015 Pride Parade. The parade was longer than last year, it generated more arrests than last year, and streets did not open until nearly an hour later than in 2014. The alderman’s summary does not mention how many citations were issued for drinking on the public way. 230 so-called “ANOVs” were issued last year, compared to 10 in 2013. Here are some stats from the alderman's newsletter along with comparisons from 2014 and 2013. Parade length: It ran 4 hours, 42 minutes. That's 1 hour, 32 minutes longer than last year and nearly two hours longer than 2013 according to this Streets & San recap from 2014. Well, not really. That protest only lasted 10 minutes. And the wayward driver who cruised into the parade route could account for another 20 minutes. So, without those delays, the parade was still over four hours long. Liquor bottles were everywhere in the hours after this year's parade. The city says this is a marked improvement. The real reason that the parade continues to run way past its promised window of 2-1/2 hours is that it is too long. Suggestion: Cut the number of parade entries by 35% and increase the entry fees by 35%. • 52 Pride parade-related arrests were made this year. That's up from 46 arrests last year and another 46 in 2013. • 206 cars were towed this year, up from 189 last year. • Streets & Sanitation began cleaning along the parade route immediately after the last float and the streets were opened to traffic at 7:42pm. That's 52 minutes later than streets were reopened in 2014 according to this Streets & Sanitation parade recap that we secured. “Overall, it was noted that there was a significant decrease in the number of open containers along the parade route which was attibuted [sic] to a greater security presence along the route and the alcohol checkpoints implemented this year. The CTA institued [sic] an improved transportation and safety strategy as well. Due to these improvements, the Belmont 'L' stop did not need to to close like it has in previous years due to overcrowding. 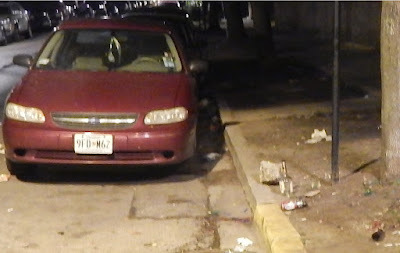 Based on the incredible (and it was incredible) number of liquor bottles that we saw along Halsted and side streets this year, we'd suggest that the real liquor enforcement should be rolled out at sunset. Of course, arrests only count the number of crimes in which an offender was taken into custody. • Stabbing/Gunshot victims: 3 stabbings this year. 1 shooting last year. None in 2013. • Robberies: 3 this year, compared to 5 last year and 4 in 2013. • Aggravated batteries: 8 this year, compared to 3 last year and 2 in 2013. • Resisting police: 2 this year. None in 2014 or 2013. • Weapons violations: 1 this year. None in 2014 or 2013.